Blake was right: in Paradise Lost, Satan and his crew are by far the most interesting and, for the most part, admirable characters. They are in a bad place. Literally. They address themselves with commendable directness to their problems. Shall they continue the war, which they now know to be hopeless? Shall they reconcile themselves to accept eternal punishment? Shall they attempt to remodel Hell to make it less unpleasant, or to change themselves to better fit their circumstances? Or shall they use their wits to conquer a new world? Their place of rest, and Providence their guide. Milton is more fun than his reputation would suggest, and this lovely edition is nicely printed, nicely bound, yet not unreasonably expensive. Everyone was talking about veal stock this week. I spent the weekend roasting bones and simmering at a lazy bubble and skimming, skimming, until it was so good it hurts. And so I found myself rereading the opening chapter of Michael Ruhlman's mastwork, and one thing led to another. A tasty pendant to Paradise Lost. Although I think I agree with the conclusion of Clay Shirky's new talk about Gin, Television, and Social Surplus, the way he gets there is probably not the best route. The purpose of art is to delight us; certain men and women (no smarter than you or I) whose art can delight us have been given dispensation from going out and fetching water and carrying wood. It's no more elaborate than that. That might be right, but Shirky argues through historical analogy with the industrial revolution. The transformation from rural to urban life was so sudden, and so wrenching, that the only thing society could do to manage was to drink itself into a stupor for a generation. The stories from that era are amazing-- there were gin pushcarts working their way through the streets of London. This sounds good, but inconveniently, it's wrong. Yes, early industrial Britain drank a lot. In Nelson's navy, the minimum liquor ration was something like 4oz of rum a day, often supplemented by plenty of beer. This wasn't hard partying, it wasn't decadence; anything less was thought to be cruel and inhuman, even for men to whom weevily bread and the lash were part of daily life. But their great grandparents drank even more; in Medieval Northern Europe, beer was the main staple food for many months of the year. Sure, there were gin pushcarts. There were pushcarts for cherries and mackerel and matches and milk, for knife grinding and chair mending. Shops were for rich folk; small businessmen went from door to door. This wasn't new: Gibbons set The Cryes of London for five voices and viols before 1625, and he wasn't alone. This was true almost to living memory; Eliza Doolittle sells flowers on the steps of Covent Garden and her ambition is to someday, somehow, be employed in a flower shop. If I had to pick the critical technology for the 20th century, the bit of social lubricant without which the wheels would've come off the whole enterprise, I'd say it was the sitcom. Yes, it is bread we fight for -- but we fight for roses, too! Yes: creativity and appropriation, interaction and re-creation: all are important. Yes: history shapes this, and yes: this will shape history. But you've got to get the argument right; sounding good isn't good enough. Mike Power thinks I'm mistaken. Yes, the gin craze was real, and it was urban. But in the very long view, it's a shift in alcohol. Shakespeare's age drank a lot of fortified wine: sack and malmsey and possets — and a lot of ale. Before then, the middle ages drank even more ale; there was no better way to preserve grain from rodents than to brew it, so much of Europe could either be tipsy or starve. 2.2 gallons per person per year, the 1743 peak, is not that much, even by modern post-temperance standards. Russia's vodka consumption is higher than this, and France's 54 lit=14 gallons of wine per person is certainly in the ballpark. Gin was manufactured and concentrated, which made it ideal in the new industrial cities; where transporting liquids was incredibly expensive, requiring horses and carts and cooperage, concentrated gin made a lot of sense. Day two: take the bones and vegetables from yesterday's stock out of the refrigerator, fill the pot with cold water, and do it all over again. I've never tried remouillage like this before; it sounded like cheese paring. But the ten hours of simmering on Saturday left me just 32oz of stock — very strong, rich, gelatinous stock to be sure, but it's still just four cups. So, once more into the breach. This was also my first encounter with the Super 88 fish counter, which looks very promising. Many tanks of live fish, and lots of fresh fish I've never tried. With everyone talking about the glories of veal stock, I realized my reserves of stock were just about exhausted. And so, with 7 pounds of really nice veal bones from Savenor's, I embarked on a stock weekend. You don't have to make a big tsimmes, as Ruhlman recently reminded us. Grab 3 lb of bones, roast them if feel inclined, toss them in a pot, fill it with water, and leave it uncovered in a 180° oven for a few hours, Easy as pie. You can add mirepoix, you can add a sachet, you can do all sorts of stuff. You don't have to. Nobody will take off points. Innovations this time: the pot was uncovered throughout, and I let it simmer a little more aggressively than usual. I also let it go for five hours before adding the mirepoix (roasted onion, carrot, and celery) and tomato, where previously these went in from the start. I borrowed two ladles of veal stock for dinner, to make a nice mushroom sauce for the roast chicken. Hot pan, olive oil, shallots. Mushrooms. Deglaze the roasting pane with the veal stock; add to the mushrooms, reduce. Serve. The entree made a really nice plate. The only bad news is that, after the sauce tonight, I only managed 32oz of stock. Ouch. But there's still the remouillage tommorrow. We know almost nothing about Shakespeare's biography, but we do have one record of something he actually said, not wrote. On Monday 11 May 1612, William Shakespeare gave evidence in a lawsuit at the Court of Requests in Westminster. This deposition involves a dispute over an unpaid dowry; back in 1604, when he was lodging in Silver Street with in the Montjoy household, Christopher Montjoy has asked Shakespeare to convince Montjoy's former apprentice to marry Montjoy's daughter and to officiate at the betrothal. Shakespeare obliged. The family has now fallen out, the son-in-law is suing for his dowry, and Shakespeare testifies that some dowry was agreed, but he can't remember the exact amount. From this small shred, Nichols pursues a fascinating, rigorous, and readable pursuit of Shakespeare's London environment. The house on Silver Street is gone, burnt in The Great Fire. Silver Street itself is gone, erased in postwar development. We can know that Shakespeare's room was upstairs, as was the privy. We can know he had a window. He finds out who else lived on the street, how they lived, whom they married. And though we have no idea in which direction Shakespeare's window faced, Nichols reconstructs that he might have looked out on the busy shopping street, or overlooked the parish churchyard, or perhaps had a nice view into a neighboring apothecary garden. And he finds out what they grew in that garden, and why. Nichols' tireless search through record rolls, tax ledgers, physician’s case books, property archives, and the entire body of Elizabethan and Jacobean literature yields remarkable detail. When the newly-married couple moved out of the house, they moved in with George Wilkins, a nearby victualler who longed to be a poet, who was indeed writing a play (Pericles) with Shakespeare, and who — Nichols pieces together the evidence very neatly — seems to have at the same time been launching a career as a pimp. Nichols is careful not to dash beyond the evidence, but his point is wonderful. As Shakespeare was writing Lear, we know — we have contemporary testimony from multiple sources — that in the house where he was living, a young bride and her father were bitterly falling out. They moved into a friend's house, a shady friend — shadier, perhaps, than they realized — at about the time Shakespeare is writing about a virtuous woman living in a brothel. Tim Bray observes that there's a lot of change going on right now in the software world right now, an unusual ferment in which established ideas about programming languages, databases, networks, processors, business models, and kitchen sinks are very much up for grabs. Cathy Marshall on arts and crafts. French Laundry At Home on veal stock. Ruhlman on veal stock, too. (Useful point: you don't need to make tons of stock at once. You can, but you don't have to. When I visited the truffle farmer, he was making about a quart of chicken stock!) I've really got to replenish the stock supply! Linda has been arguing for some time that we should have handled Iraq differently. I think she has the key. Michael Gordon's recent report on the garbage-strewn, sewage-choked streets of Sadr City crystalizes the issue. We've been there for years: we haven't we cleaned this up? What happened to Can Do? 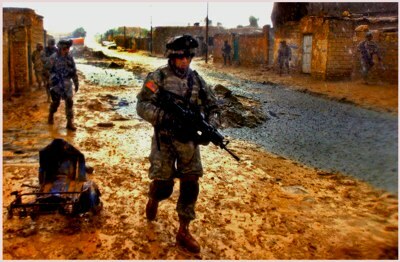 Instead, the Iraqis send twenty people to pick up the garbage, and then the Americans send some soldiers to check. The trash collectors are outfitted with yellow vests. On Monday morning, a soldier asked for an “eyes on” report over the tactical radio on how many workers were picking up trash along a major thoroughfare. This isn't working. Here's one way it could work: let's send a LOT of people to help clean up Sadr City. Me, you, everyone we know. Start with 5,000, and build from there. And what you do is simple: pick up the garbage. You'll have some soldiers along, to organize and to provide some security. Maybe someone will start shooting: we'll try to keep everyone safe. Someone might get hurt: it happens in a war. Thousand of Americans have gotten hurt already. So, you start somewhere; you pick up the garbage. You dry up the puddles. You take pictures. You try to be polite. If there's stuff that seems to need fixing, you try to fix it. Lots of hands, lots of people. Some of the people are famous. Ted Williams flew fighter planes, James Roosevelt won a silver star. Let's send some athletes and some singers; it'll be fun. Lots of folks — plumbers, electricians, builders, bakers, cops. All together — there's safety in numbers, it's a party. Spring cleaning. We'll need to bring along some food trucks, because all these folk are going to want snacks and lunch. We'll do what we can. We can bring lots of cold Coke, and share it. We'll have lots of freshly-baked bread — which we can buy from Iraqi bakers. We'll have lots of fresh vegetables. We'll have lots of portable toilets and first aid stations. So America's Fighting Garbage Persons go out and they do a really good job, cleaning the street, maybe fixing what needs to be fixed. Maybe, just maybe, someone says, "But the plumbing in my house is broken.” Well, maybe we can find a plumber in the crowd. Maybe, just maybe, someone says, “My kid is sick.” We find a doctor in the crowd. And eventually the doctor might ask if she could perhaps stay and keep an eye on the baby here, and perhaps look at some other kids on the block? And before you know it, you've got a little clinic, or the start of a Hull House. And every night on the news, you see pictures of Chelsea and Jenna picking up the trash with a bunch of Stanford students, and Manny Ramirez helping to paint a wall, and the plumber from Oshkosh fixing the sewers while Joni and Bruce and Keren Ann get set up. And yes, some of the residents are going to say, “I hate this noise! The crowds! The music! And couldn't they have sent Madonna?” We'll sort it out. Sure, someone is gonna get shot, someone is gonna try to blow stuff up. We'll do our best. War is hell. We've got thousands of casualties of sunk cost; they won't get everyone. And what's the point of blowing up garbage persons? And maybe we can make some friends. Maybe, we can fix the plumbing and get the lights working again. And even if we don't, we'll at the very least have cleaned up some of the mess. Steven Poole offers a cogent discussion of the incoherent (but widespread) view that writers should give away their work on the internet, and live off university salaries or t-shirt sales. Thirty thousand people downloaded a copy of his eight-year-old book; seventeen or eighteen elected to pay something — and several of those chose to pay one cent. I've added hcard microformat markup to this page, so your semantic web applications can (with luck) discover contact information and such automatically. To my surprise, though, I haven't found a validator, or even much software that seems to use hcard. So, I really have no idea whether this markup will work with the stuff people have in mind. If it doesn't, let me know. There's a new flickr pool for Tinderbox maps and other Tinderbox-related images. I think it would be fascinating to collect a bunch of Tinderbox map views; this could be a nice resource for designers and researchers, and would also supply inspiration. 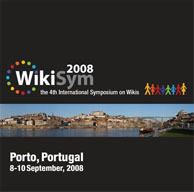 It’s the conference for discussing & sharing wiki research & practice. Share your wiki adoption strategies at the first-ever WikiFest. Get valuable feedback and ideas from fellow wiki experts. It’s in Porto, a wonderful and historical city! It’s fun! You’ll build great relationships with the people you meet! The duck confit really calls for corn crepes, but this is a silly time to be playing with corn and a good time to grab some mushrooms. 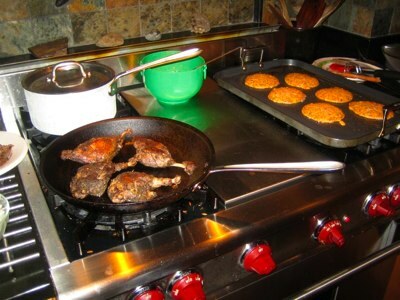 Since they vegetables are pureed anyway, I replaced the corn with mushrooms, sauteed in garlic. The picadillo usually begins with boiled pork shoulder, but I wasn't wild about pork tonight. Instead, I covered a chuck roast with roasted tomatillo, garlic, and chipotles, and roasted it in a dutch oven for about 2.5 hours before shredding the beef and finishing it in a skillet with sweet onions, fast-cooked tomato-chipotle sauce, cinnamon, cloves, raisins, and slivered almonds. .... to justify god's ways to man. But Milton does pretty well. I've never attempted Paradise Lost, but you've got to hand it to a guy who could do such a nice job of imagining what Satan's army would be inclined to say to each other after they'd lost the big one. Good punch! But an apology in advance might best be made right now. A semicolon he did not admire. But don't perplex the reader of his work. Steve Ersinghaus has a fascinating new reading of Mary-Kim Arnold's “Lust”. Susan Gibb asks, what makes one story cry out for hypertext, while another seems better told in simple, linear form? Liz Losh, who blogs about digital rhetoric, makes a good point about the value of PowerPoint and the like for presentations by people who are disabled, describing a presentation by Stephen Hawking. It's easy to be critical of bad PowerPoint, and it's easy to fall into bad presentation habits. But, used well, PowerPoint and Keynote can be effective ornaments to a talk, and they're invaluable to speakers whose voice is limited, or when language or logistics interfere with the audience's hearing or understanding the speaker. Having reread The Subtle Knife, I found I couldn't stop there. And so here we are. Pullman does a fascinating and complex job of showing his characters grow up without making a fuss or calling attention. In the first book, Lyra has plenty of energy and will, but it's all about hiding from grownups or manipulating them, or running away. She's a child. In The Subtle Knife, she's on her own, alone with Will and her guiding spirit and with a mission she doesn't understand but knows is right. And in The Amber Spyglass, she is in control and in charge and she knows what must be done; she is a woman long before she walks into that murmurous golden glade. (That's &#189; in HTML) Understanding and taking advantage of OpenType fonts and all their new capabilities to make things look better and clearer is one of many ways most of us fail to let our computers do what they can for us. Did you know that the built-in Programmer's Calculator (look at the View menu!) has a button for Unicode, that lets you see the unicode character for any number -- hex or decimal? Neither did I. What I still don't understand is how you use the Mac OS X Characters palette to find the Unicode value for a specific glyph. Email me. Update: It's easy. Open the character palette, select the character, and hover. The tooltip gives you the Unicode character code. Thanks to Stephen Hoffman, the first to get it! Want to follow me on twitter? Try this. If the person who hires writers comes out of his cave and says, Who has 500 words on my mother's new play? do not pause to think, What is his mother's name, and what is her play, and is it that play that is not very good? Raise your hand and say, I, sir, have 750 words on your mother's new play, and might I add, sir: Brava! Then they let you in the gate and the rest of the writers have to stand outside pretending to buy one another drinks. Once inside, you say, I completely lied, and then they beat you, but they are not very strong. They are editors. 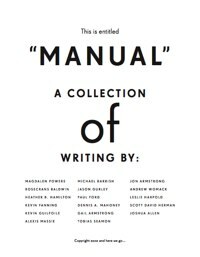 Also of interest (and neatly designed): Manual, an anthology of how-to writing from writers with Web sites (as a downloadable pdf). How to show your work, How to get your man to propose, How to build a fence. Adventure and scriptwriter Greg McQueen has a lovely little screencast that demonstrates a nice way to visualize your writing in Tinderbox, even if the writing spans many notes. It's not just my neighbor. Kevin Kelly talks about The Tools of Cool Tools. Khoi Vinh discusses the advantages of Yojimbo for note-taking and snippet collecting, especially the fact that its sync'ing generally works, while other sync schemes often do not. Tinderbox comes with a free copy of Yojimbo for exactly that reason. For reasons fathomless to me, I'm finally reading Paradise Lost. It's quite a story. Here, the fallen angels leave the Council and try to find some ways to pass the time until Satan returns from Eden. The irksome hours, till his great Chief return. How can you not like a guy who devotes several pages to describing how the fallen angels set out to amuse themselves while they wait for something — anything — to turn up? This is the sort of question that Battlestar Galactica engages. The season opener was a slight thing, but Battlestar, uniquely, seems intent to grapple with real theological questions. Starbuck has had a Revelation: can she trust it? Can anyone else? 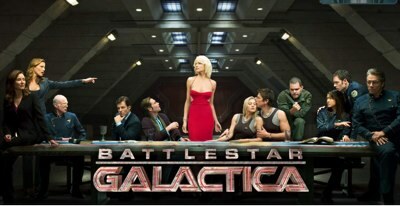 Gaius Baltar is a bad man who is praying in a good cause; if prayers are heard, can his be answered? Can artifacts have free will? The Cylons know that they have one Creator and that the Creator loves them: are they the visible elect? 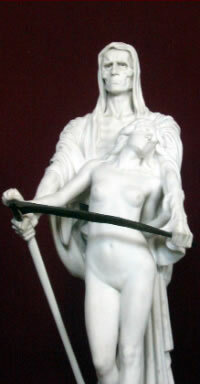 Or are they (with Milton) of Satan's party, revolting against an authority they did not authorize? Meanwhile, I do wish I could figure out what painting(s) are being quoted in this season's promotional picture (here, or in the front of the New Yorker). It's not just Da Vinci's Last Supper. Look at the figures on the right; I know I've seen them before, and Sharon's hand gesture (and Chief's) are not, I think, casual accidents.